SEM का full form हैं Search Engine Marketing. SEM एक ऐसा प्रोसेस हे जिससे की आप अपना बिज़नेस इनक्रीस कर सकते हैं . SEM फुल्ली पेड प्रोसेस हे, हम जब भी किसी भी सर्च इंजन पे कुछ भी सर्च करते हैं तब हमे टॉप पे कुछ रिजल्ट्स शो होता हैं जहाँ लिखा होता हे ads by google, मतलब वो भी सर्च इंजन मार्केटिंग है। अद्वेर्तिसेर्स ने गूगल को कुछ स्पेसिफिक अमाउंट पे किया हैं तभी उनका रिजल्ट्स सबसे टॉप पे शो करा रहा हे , Search engine Marketing एक बोहोत ही इफेक्टिव वे हैं बिज़नेस को ग्रो करने का, तोह इसी को Search Engine Marketing कहते हैं . 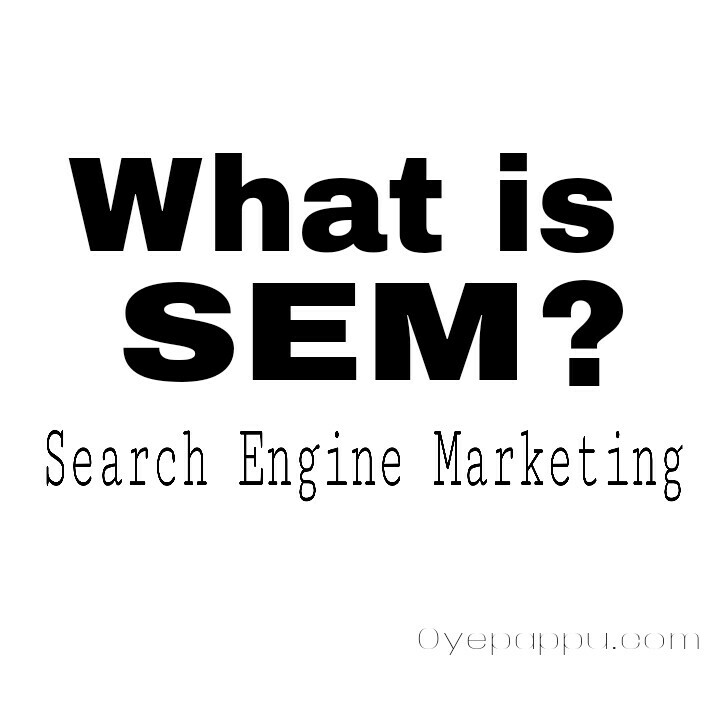 What is SEM in English? Search engine marketing or SEM is one of the most effective ways to grow your business in an increasingly competitive marketplace. With millions of businesses out there all vying for the same eyeballs, it’s never been more important to advertise online, and search engine marketing is the most effective way to promote your products and grow your business. In this Guide, you’ll learn an overview of search engine marketing basics as well as some tips and strategies for doing search engine marketing right. What is the differences between SEM and SEO ? Generally, Search Engine Marketing refers to paid search marketing, a system where businesses pay Google to show their ads in the search results. Search Engine Optimization or SEO is different because businesses don’t pay Google for traffic and clicks; rather, they earn a free spot in in the search results by having the most relevant content for a given keyword search. Both SEO & SEM should be fundamental parts of your online marketing strategy. SEO is a powerful way to drive evergreen traffic at the top of the funnel, while search engine advertisements are a highly cost-effective way to drive conversions at the bottom of the funnel. How to Rank your website or Blog into Google Search? Share Market me Invest karne k liye kya jaruri hota hain?